As we can see dragon in the myths around the world and also dragon-like animal in bible, we should now consider that dragon had been exist. We all know that dinosaurs were exists in the past, and they might be in the same species as the dragon. Chinese Zodiac has 12 kinds of animals, and 11 of them are real. Dragon is the one that we are not pretty sure if it is real. Anyway, it should have been existed in the time that Chinese people create the Zodiac. Some theory says that dragon has never existed, and what we saw in the myth is just humans’ imagination from the dinosaur’s bone they found. If this theory is true, that means humans have never been in the same period with dinosaurs; which is against Holy Bible. 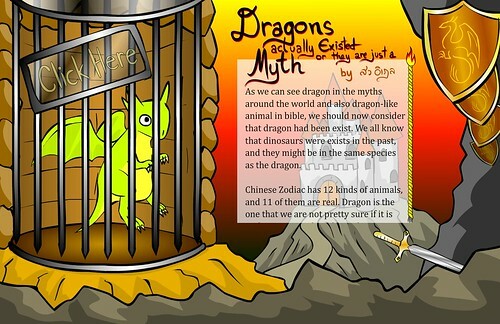 If dragon is real, how did its fire work, and how could it fly with those small wings? SE-ED magazine talked about this issued about 10 years ago. Physically, dragon should have been able to synthesize hydrogen from the food. Hydrogen could help the dragon to float in the air, and its small wings were just for controlling the direction. And this is reasonably that dragon could make fire as we can see in the balloon. To create hydrogen from the food, dragon needed to have very-high gastric acid, as we can see in car battery. And this high acid could let the dragon could eat the warrior with armor. This high acid could be the reason that no one found the dragon’s fossil. Komodo Dragon feces also shows another interesting point that it is very hard to find a dragon’s fossil, because Komodo Dragon’s stomach can digest the bone of its prey. 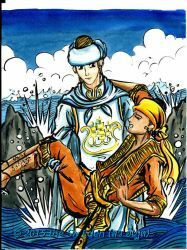 The layout of this page is more like myth or the western dragon story. It has a cute green dragon in the cage which says, “Click Here”. 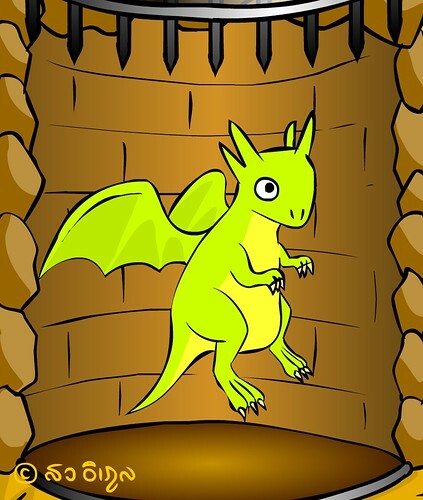 This means the user can click, and the cage will open, then the dragon is free. On the right side of the page is a short article about dragon belief, and it has a rope-like scroll bar which made by the action script of drag and drop mixing with the position of movie clip. At the low-right corner, it has a mouse-following sword, which I got feed back from my mother and prof. Ivan, that the dragon should be able to hold the sword and swing it around.